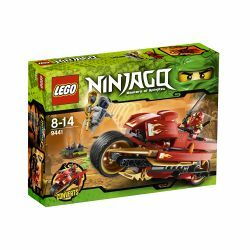 9441 Kai's Blade Cycle is a Ninjago set released in late November 2011. It includes a large red and gold motorcycle, Kai ZX, and Rattla holding the Hypnobrai Snake Staff. When the button in front of Kai is pressed, the blades pop out. This is a description taken from LEGO.com. Please do not modify it. (visit this item's product page) Battle for the golden Hypnobrai staff with Kai’s Blade Cycle! Race after Rattla on Kai’s Blade Cycle! Don’t let him get away with the golden Hypnobrai staff and the anti-venom hidden inside! Can Kai defeat his mind-controlling menace with the Blade Cycle’s big blade attack? You decide! Watch out for Rattla’s hypnotic stare and tail as you battle for the prize! Includes Kai ZX and Rattla minifigures, golden Hyponobrai staff and 2 ninja swords. Race after Rattla to seize the staff and the anti-venom inside! Launch the big blade attack function to stop Rattla in his tracks! The decal on the right side of the cycle features an oil pump. Above it reads "Octane-88". This is one of the sets in the 3-in-1 pack. The decal on the left side features a defeated-snakes count. A top down view of the bike. The side of the bike. Facts about "9441 Kai's Blade Cycle"
Battle for the golden Hypnobrai staff with Kai’s Blade Cycle! This page was last edited on 28 April 2016, at 00:36.